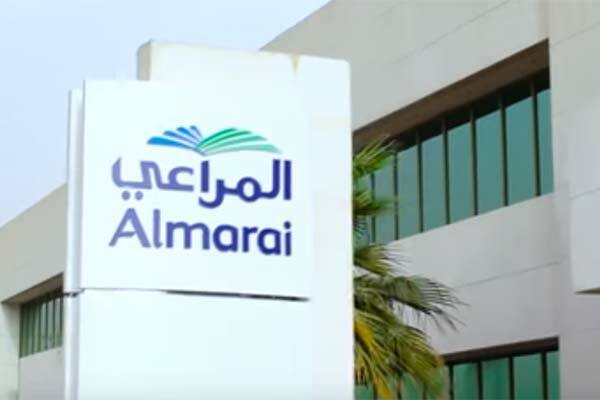 Saudi Arabia's Almarai, the largest dairy company in the Gulf, has reported a revenue of SR3.731 billion ($994.6 million) for the second quarter of this year, a decrease by 0.8 per cent compared to SR3.760 billion ($1.002 billion) in Q2 last year. The gross profit for the quarter amounted to SR1.505 billion ($401.3 million), a decrease of 3.2 per cent as compared to the corresponding quarter of the last year which was SR1.554 billion ($414.5 million), said a statement from the company. The operating profit for the second quarter amounted to SR759.7 million ($202.4 million), a decrease of 3.6 per cent as compared to the corresponding quarter of the last year at SR788.2 million ($210.09 million), it said. The consolidated profit attributable to shareholders of the company for the second quarter amounted to SR660.6 million ($176.08 million), a decrease of 2 per cent as compared to the corresponding quarter of the last year of SR674.1 million ($179.68 million) and an increase of 91.9 per cent as compared to the previous quarter of SR344.2 million ($91.75 million). The comprehensive income attributable to shareholders of the company for the second quarter amounted to SR562.9 million ($150.04 million), a decrease of 12.7 per cent as compared to the corresponding quarter of the last year of SR645.0 million ($171.9 million) and an increase of 59.2 per cent as compared to the previous quarter of SR353.5 million ($94.2 million). The revenue for the six months ended June 30, amounted to SR6.963 billion ($1.856 billion), a decrease by 2.5 per cent as compared to the corresponding period of last year SR7.143 billion ($1.904 billion). The gross profit for the six months ended June 30, amounted to SR2.758 billion ($735.2 million), an increase of 1.0 per cent as compared to the corresponding period of last year at SR2.732 billion ($728.31 million). The operating profit for the same period amounted to SR1.240 billion ($330.62 million), an increase of 2.6 per cent as compared to the corresponding period of last year SR1.209 billion ($322.3 million). The consolidated profit attributable to shareholders of the company for the six months period amounted to SR1.004 billion ($267.8 million), an increase of 0.2 per cent as compared to the corresponding period of last year at SR1.002 billion ($267.1 million). The comprehensive income attributable to shareholders of the company for six months ended June 30, amounted to SR916.3 million ($244.2 million), a decrease of 14.4 per cent as compared to the corresponding period of last year SR1.071 billion ($285.5 million). The earnings per share (EPS) based on the profit attributable to shareholders of the company for six months ended June 30, and the corresponding period of last year, reached SR0.98 and SR0.97 respectively. Diluted EPS for the same period and the corresponding period of last year are 0.97 and 0.97, respectively. Total equity attributable to shareholders as of June 30, amounted to SR12.866 billion ($3.429 billion) as compared to the corresponding date of last year SR11.660 billion ($3.107 billion), an increase of 10.5 per cent. The book value of one share as of June 30, reached SR12.9 ($3.44). Revenues: Reduction in topline growth of 0.8 per cent is due to a decline in export sales, changes in demographics, a general contraction in the market coupled with an increase in product promotions and general changes in the product portfolio mix. Gross Profit: Decreased by 3.2 per cent is due to higher cost of sales which is primarily driven by higher alfalfa cost and an increase in labour costs. This has been partially offset by better cost management, stable commodity costs and enhanced production efficiencies. Selling and Distribution Expenses (S&D): Were higher by SR10.8 million ($2.88 million). This is due higher general marketing expenses and trade support offset by better efficiencies in route to market and trade operations.